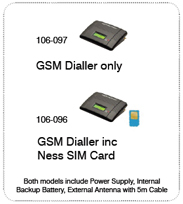 The Ness GSM Dialler provides a full time GSM pathway for alarm diallers to communicate in the absence of a land line. Plug-and-go operation - no programming required. Antenna with magnetic base supplied - long cable allows the unit to be installed in a secure housing. Backlit LCD display shows system status and call progress. Available with Ness SIM card or BYO SIM.